I am taking liberties here by naming these crispy, flaky flatbreads piadine. Piadine are from Emilia-Romagna, thin breads flavored with lard and raised by baking soda, griddled to a golden color and folded around Prosciutto, salty cheeses, or greens, depending on the occasion and the appetite. The recipe below tastes like a hybrid between a piadina and a thin focaccia; to make it, you need a good quality flour tortilla (homemade or store-bought). At my cooking school in New York City, I stuff flour tortillas with cheese and roasted chicken, or cheese and arugula, or cheese and sundried tomatoes, or cheese and… you name it! 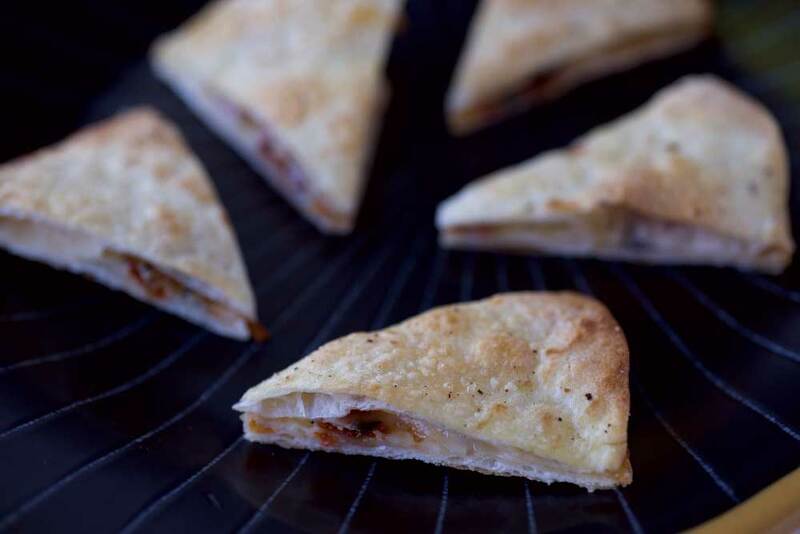 We serve these addictive “piadine” as finger foods, and no one can ever get enough of them. Everyone wants the recipe. So, finally, here it is: nothing could be easier. You can freeze the piadine after stuffing and before baking, wrapped in parchment and enclosed in freezer-safe plastic bags; just defrost a few hours before you are ready to serve. They make a great meal with a green salad alongside, or impressive (and easy) finger foods when cut into triangles after baking, as in the photo here. Preheat the oven to 425 degrees(preferably set on convection bake). Line a baking sheet with parchment paper. Place 2 flour tortilla shells on the parchment paper-lined baking sheet. Top each with half of the Provolone, sundried tomatoes, olives, and basil. Top each with a second tortilla shell. Brush with the olive oil and sprinkle with the salt and pepper. Bake for 8 minutes in the preheated oven, or until golden and crisp. 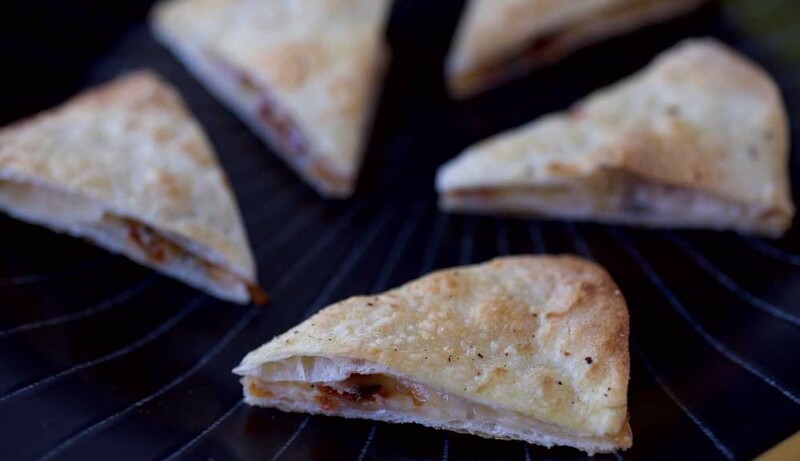 Serve hot, cutting each into quarters as a main course or into 12 triangles as finger food.